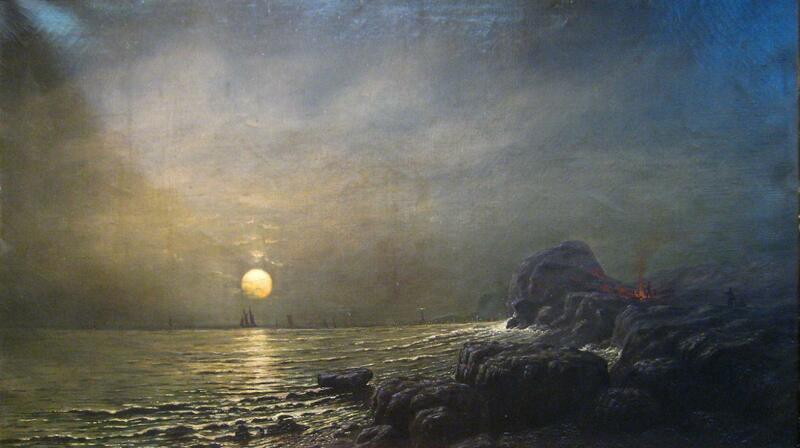 This beautiful oil on canvas by Alexis Jean Fournier (1865-1948) depicts an evening oceanfront with full moon rising over the horizon, with men gathered around a campfire on the rocky coastline. The painting resides in an ornate, period giltwood frame measuring 45" by 30" by 3.5". Stretcher measures 31" by 21". 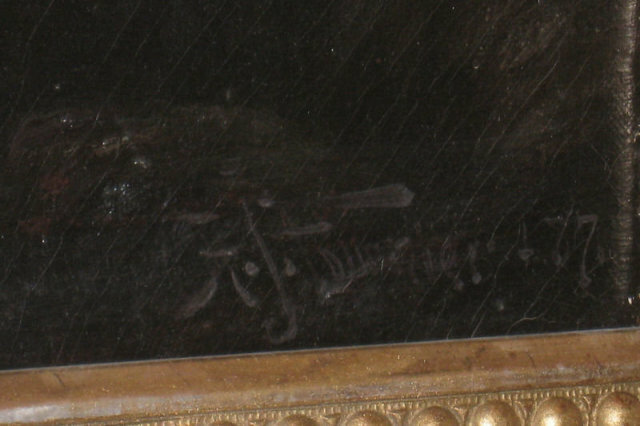 Signed and dated by the artist in the lower right corner. On verso the artist has titled, signed and dated the work as well. 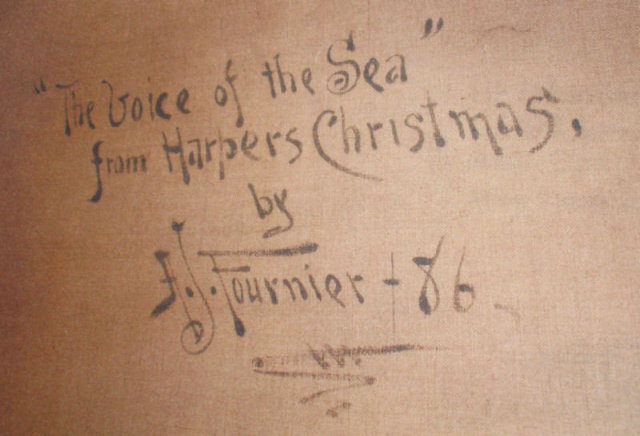 It is titled "Voice of the Sea" with mention of "Harpers Christmas", suggesting the work may have been reproduced and included in the Harper's monthly in December of 1886. Fournier was born in St. Paul, Minnesota in 1865, and was largely self-taught. He painted in the plein air fashion, traveled to France to study and paint, and his style is most commonly associated with the Barbizon school. He is considered an important figure in the American Arts and Crafts movement. He moved to Aurora, New York in 1903 to join the Roycrofters, and is known as the "Roycroft court painter" who contributed to the community for over forty years. There he founded the Paint and Varnish Club, making numerous boat trips with the group to find attractive spots to paint. The highest known hammer price for a work by Fournier is believed to $41,800, achieved in lot 147 for a work entitled Hollyhocks in the Garden of Bungle House (oil on canvas, 26&frac14; × 40&frac14; in), offered by Christie's in New York on September 23, 1992. Bibliography: Cohen, R.N. : L'Art d'Alexis Jean Fournier, St-Cloud, 1985; Benezit Dictionnaire Des Peintres, Sculpteurs, Dessinateurs Et Graveurs. 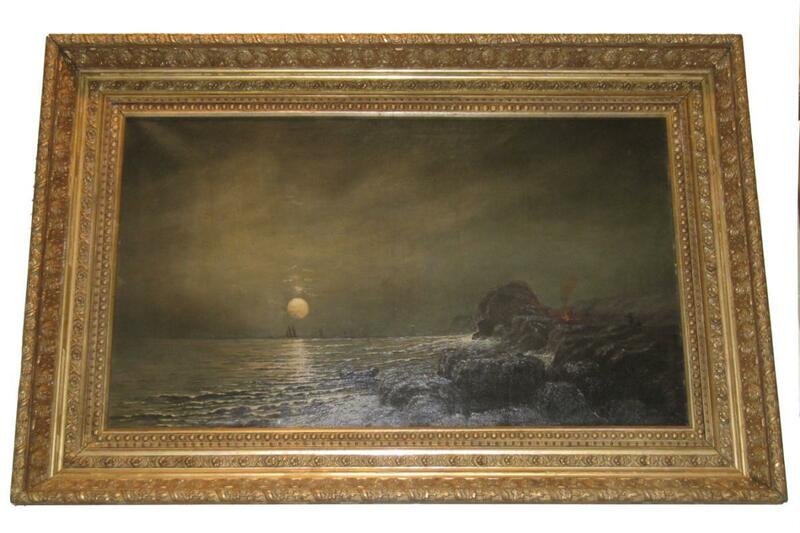 Items Similar To "Roycrofter Alexis Jean Fournier (1865-1948) Moonlit Seascape Oil ..."